My mother, who is soon heading off to Spain with her siblings, recently made an offhand comment that she would need to pick up a prescription for Valium to keep her calm while flying. As a frightened flyer myself, I understood her anxiety about the concept of being transported from one location to the next at a unnatural height of 35,000 feet, not to mention the risk of crashing into care bears everywhere. Perhaps my single greatest annoyance is the argument given to me by placating passengers everywhere — “Oh don’t worry, you’re more likely to get killed in a car crash than a plane crash” — as if my petrified panic very mild anxiety will be reduced by simple statistics. In any case, I related to my mother as I, too, need urgent access to medication in order to reduce the profound hysteria mild angst that surfaces at the onset of flight. Yet I’ve found the Pharmacy Attendants on my plane often stall, wheeling their medicine cabinet in my direction up to 30 minutes into our flight, asking that I wait for my medicine until after the fasten seatbelt sign has been turned off. I respect their attention to safety, but I’m often unconvinced that they couldn’t have thought outside the cockpit and rolled my medicine down the aisle in my general direction while remaining stationary themselves. When they finally meander my way, at least they have the courtesy to inquire as to my preferred medication, at which time as an informed patient I choose the closest bottle with the highest medicine content (MBV —- medicine by volume) in order to relieve my cabin pressure. Within only a few minutes of taking my prescription, I note with pleasure that the clouds are very fluffy and there are no care bears in sight, meaning they have evacuated to a safe location far from the soft 140 decibel hum of the friendly jets floating gently through the blue sky. There is nothing to fear as I glide through the friendly skies because we all know that one is more likely to be killed in a car crash than a plane crash. But I’m a little hungry, and I wish they still served free peanuts. 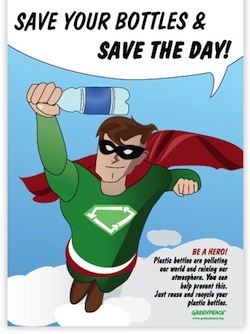 Recycle Man dropped out of The Avengers movie at the last minute because his costume wasn’t made out of recyclable material. On my morning drive to New Seasons to drink their free customer coffee buy groceries, I nostalgically bore witness to the passing of my favorite holiday with the surfacing of Christmas Tree recycling stations. And while I hate to wish Christmas goodbye, I love to recycle, be it cans, bottles, boxes, wrappers, clothes, kittens, small children*, or other items. Really, my recycling rule of thumb is that if it’s there and if you can lift it, you should throw it in the nearest recycling bin, and then you can go back to buying aerosol cans, packing your leftovers in styrofoam, and dropping hazardous waste around town, knowing you did a good deed by recycling that toddler who was just blatantly crawling around in his environmentally-unfriendly plastic diapers until you spotted him. I can lift my Christmas tree, so I carefully removed all of the ornaments, threw it in the car, and headed to the nearest tree recycling station, eager to earn karma points for next Christmas. I approached the recycling volunteers and announced my intent to recycle my tree. “That’s not a real tree,” the volunteer informed me upon eyeing my tree. You can imagine, Readers, that by this point both myself and my apparently imaginary tree were pretty insulted, so I took off with my tree in hand, carefully folding its surprisingly resilient branches before repositioning it in my backseat. Together we headed home, stopping only to recycle a stray kitten*. But while I couldn’t recycle my tree, Readers, you can, and if you’re lucky enough to be a Portlander, go to this website for more information on how to physically part with your tree. If like me you’re sad to see the season go and need more information on how to emotionally part with your tree, might I suggest a Christmas counselor, such as your favorite blogger Counselor Troi, on whom you can always rely for unsound advice. *Troi does not actually recycle animals or small children, nor does she think you should. Any evidence to the contrary, such as the discovery of her ancient blogging scrolls, should be disregarded as unreliable, untrue, and unbelievable. As we enter into the New Year, looking toward a fresh start with fresh perspective and fresh breath, we consider whether to freshen up our lives with a New Year’s resolution. 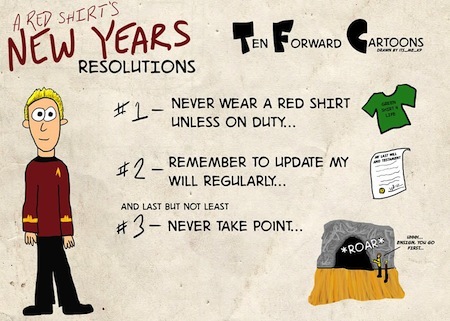 But we don’t know which resolution to choose, nor the likelihood that we’ll successfully keep our resolution, so we rush to check our favorite blog site, Trekkychick, knowing that blogger Troi will have been hard at work digging through the google archives at the internet library to support our path towards a better 2013. Well, Reader(s), you’ve come to the right place. After nearly 27 seconds of exhaustive research, my first google hit indicates that in 2012, the ten most common resolutions chosen were to: 1) Lose Weight 2) Get Organized 3) Spend Less, Save More 4) Enjoy Life to the Fullest, 5) Stay Fit and Healthy, 6) Learn Something Exciting 7) Quit Smoking, 8) Help Others in Their Dreams 9) Fall in Love, and 10) Spend More Time with Family. If you’d like to be generic and choose one of last year’s most common resolutions, might I suggest #8, Helping Others in Their Dreams. I find this option particularly alluring as it is accomplished by others dreaming about how helpful you are, rather than being consciously coerced into helping somebody during waking hours. Indeed, in the unlikely event that you are asked for help, you can say, “In your dreams!” thereby still achieving this goal. *Actually you can totally count them. It’s 5. **Unless the doctor patching up your broken foot is Dr. McDreamy from this fictional show, in which case you’re probably sleeping and caught somewhere between resolutions #8 and #9. ***I’ve just been informed by my elementary school math teacher, who coincidentally just now unsubscribed from my blog, that my calculations are wrong. I don’t want to lead my Readers astray, so I’m going to take another stab at basic multiplication using decimals. …So in fact, Readers, the correct percentage is 20.7%. Therefore, if there are 100 people in the United States, 45 of them will make a resolution, and 20.7 will actually maintain that resolution for at least six months, or 21 if we round to the nearest thousand. **** In conclusion, less than 1/4 people will make and keep their New Year’s resolution. ****My elementary math teacher just unfriended me on facebook, and my middle school social studies teacher just posted that he takes no responsibility for my position that there are only 100 people living in the United States. Good luck Readers —- You can do it! 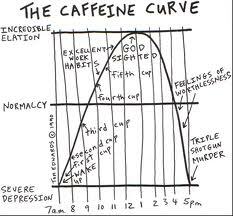 As I reflect on the past several work weeks, I observe a rather startling trend in the amount of caffeine consumed during the early morning hours – those hours in which I attempt to awaken and pry myself from the strong gravitational pull of my bed*, — and the day of the week. *It has been scientifically proven in a rather unscientific manner that the highest concentrations of gravity on earth are in one’s bed, no matter where the bed in relation to the earth and space. Scientists are still trying to uncover and reverse this concentration of gravity within the mattress infrastructure, so that one can literally float right out of bed in the morning with relative ease. **Scientist: (noun) One who took at least one science class in college. Must also look good in a lab coat. Using this fact-based formula, I observe that on Monday, having just experienced two days to recuperate from the previous work week, I can create a drip coffee with 99% decaffeinated beans, and 1% caffeinated beans – this negligible addition of caffeine intended only to offset the withdrawal headache and generally unpleasant demeanor provoked by a purely caffeine-free day. I scoff at those weaker than myself who are drinking a fully caffeinated cup and pride myself on my lack of dependence on artificial means to make it through the day. On Tuesday morning, it is unreasonable to use Monday’s exact proportions in my drip, as it has been scientifically proven*** that due to the position of the earth relative to, like, other stuff in space, Tuesdays are actually much longer than Mondays, creating the illusion of a twelve-hour work day, even if one still puts in a standard 8 – 9 hour day. Thus Tuesday necessitates a more modest ratio of decaffeinated to caffeinated, perhaps 30%/70%, (plus or minus 20% and a shot of espresso). ***Controlled studies have not yet been replicated by anyone but Troi. Come Thursday I find a refreshing absence of pretense as I fully acknowledge the important role of caffeine in one’s daily life, buoyed also by online journals, articles and blog posts touting its health benefits as part of a healthy diet and exercise program to enhance mood, endurance, and longevity. Noting that since I neither diet nor exercise I need a higher proportion of caffeine to enhance my own mood, endurance, and longevity, I grind 20% decaffeinated and 80% caffeinated beans accordingly. I notice I’m walking and talking faster at work, and nobody including myself can actually understand what I’m saying at this heightened level of functioning (think the strength and stamina of the Hulk except provoked by caffeine, not anger), but I’m pretty sure it’s a new and improved me. When I wake on Friday morning, I look with disdain on the decaffeinated beans in my cupboard – really, who buys that stuff? How did it end up in my house? – yet as a scientist I know the dangers of excess and carefully proportion only 99% caffeinated and 1% decaf (a single bean) into my drip, ensuring that I attain this crazy, higher-level state of being (I am invincible), without appearing any crazier than my friends already expect me to be (no hostile takeovers of the local coffee shop today!). I’m so productive that I actually complete all of my work only seconds after arriving at the job site. Or I could were my workload not to include a full day of working with students.